God bless a spruce. So many varieties are “no muss, no fuss.” I gave this beautiful little flattop a burlap shade wall for the winter, but that’s just me being compulsive. They have little to no problem with winter burn when left to their own devises, and even heavy snow cover fails to crack a branch. This is an exceptional dwarf for use in foundation plantings. In case you are wondering, no, I haven’t done any pruning, and won’t until four or five years down the road when I want to keep one side clear of the stone path that will curve past it, if it ever stops raining. Mature size will be 3’ tall by 5’ wide. Full to partial sun. Zone 3. Looking pretty swell here, too. I love this plant. What else is going give you a low, spreading mop-top of golden yellow dreadlocks? Give it at least five hours of direct sun and it will shine. Plant it next to anything with green or blue or purple foliage, evergreen or deciduous, and you look like a genius. Use three to six (or more) zigzagged around the landscape where the eye picks up one there, there, and over there. I gave this plant no winter protection, snow covered it from late December to early March. Mature size 18-24” tall by 3’ wide. Zone 4. 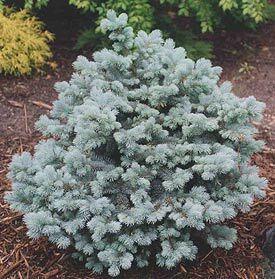 Also buy and plant Chamaecyparis thyoides ‘Heather Bun,’ featuring soft, feathery, plum-colored spring foliage that turns blue-green by midsummer, before reverting to intense plum in winter. Matures to 3’ by 3’. Full (5 hours) sun. Zone 3. God bless a spruce. 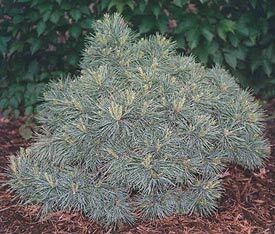 When it comes to true blue needles, no other evergreen quite matches the intensity of the blue spruce. I suppose the dwarf globe is becoming borderline common, but I never tire of seeing how I, and others, fit them into the landscape. They’re gorgeous as youngsters, and riveting after 15 to 20 years. They develop a marvelously irregular shape, often growing a bit wider than they grow tall. I gave this plant no winter protection, it disappeared into a snow drift for the month of January but the tips of most branches were exposed to full sun February through April with zero winter burn. In fact, this plant has not lost a needle since planting last spring. Matures to 5’ tall by 6’ wide. Full sun. Zone 2, for cryin’ out loud. Hello, Doug and Neets in Edmonton! Am I doing anything yet for you newcomers to the site who haven’t snooped around long enough to read all my rants on how perennials and annuals are lovely, thrilling, essential, wonderful, blah blah blah, but the big secret to creating a magical landscape around your home and extending out into your yard is to explore and become familiar with the amazing world of shrubs? Take this little number right here. It’s a yew, for god’s sake, except yellow as cornbread. What will they think of next? This plant loves being pruned and shaped, and would be a good choice were you desirous of a topiary in the shape of a prostrate Donald Duck. You’ll have a hard time finding one at local nurseries – I buy them all. Prefers partial shade. I gave this plant a burlap wall on the south side during winter. Next winter it’s on its own and all reports confirm it should handle the morning winter sun it will receive with at most minor winterburn. Can you see this plant in your mind’s eye when it’s 5 to 6’ tall, and a rolling, billowy, blousy 5’ wide, looking like some giant, screaming yellow, exploding bombshell careening off the southeast corner of my humble abode? Can you? Can you? 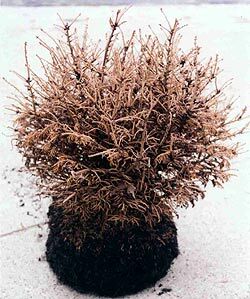 Virtually all weeping evergreens are freak seedlings discovered in the wild by astute plantspeople. From their cuttings, and, in some cases, cell transplants, nurseries propagate replicas of the original freak, and the plant enters the nursery trade (seeds from the plant almost always revert back to standard form). 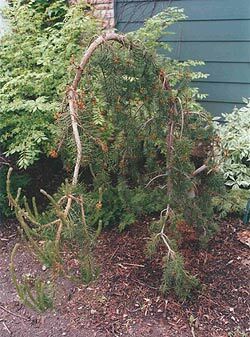 This is one of my favorite freaks, and it would take a freak of nature to turn a jack pine – the scurvy dog of the evergreen world – into a show-stopping centerpiece. Bear in mind that placement of an ‘Uncle Fogey,’ to quote my favorite witch, must be handled delicately. Too often I see them planted pretty much alone, the designer or homeowner confused by the garish, nearly grotesque appearance. It’s a tree, and an expensive one at that, not some cheap, stamped sheet metal sculpture of an angel. Go easy on the old boy. Plant him in the foundation border amid other shrubs (there will be more microbiota across his front, if it ever stops, well, you know) so that he can poke and creak out at and startle the viewer. I moved this tree twice in three years before I got him in the right spot, and he didn’t care. Full (five hours) sun. Hardy to Zone 2 (jack pines grow just shy of the Arctic Circle). 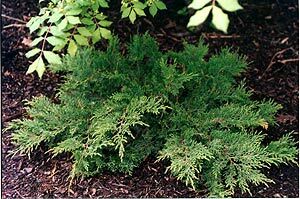 Here is the shade-loving evergreen for the new millennium, my new, favorite, ground-hugging shrub. Microbiota grows only 12” tall but spreads 6’ across over time. 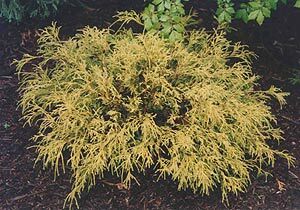 Foliage resembles that of an arborvitae, but adds the neat trick of turning bronze in fall and winter, before greening up – seemingly overnight – when it clicks back to life in spring. 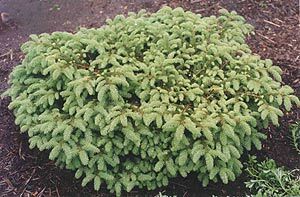 It like it cool, making it a wonderful understory plant in the mixed evergreen/deciduous shrub border. Soil must be well-drained, or the plant may suffer root-rot. Morning sun/afternoon shade, dappled shade, really any kind of shade except full shade serves this plant well. As it matures you can prune it into any number of contorted shapes, so that it curves and twists exactly where you want it to spread and cover. Let the snow cover it in winter, but fear not if snow cover is sparse – winterburn is not in this plant’s vocabulary. Hardy to Zone 2. This dwarf, light blue/green form of white pine is one of the great wonders of the plant world. It grows quite quickly to a mature size of 4-6’ tall by 6-8’ wide. There’s a mature specimen near the front door to Bachmans Wholesale down in Farmington that will knock your socks off. It resembles a waterfall. I gave this one a burlap wall this first winter, just because I’m paranoid, but now that it’s establishing a solid root system, with proper fall care and watering winterburn will be of no concern. Don’t buy too big a specimen at the nursery, go with a good, full, rounded plant in a #7 container, or smaller. Zone 3. God bless a spruce? Let it be known, the Renegade Gardener is not above killing a plant. Though this annihilation surprised me – I gave it a burlap wall, proper fall care, it was green and lovely all winter, as the snow cover came and went, and it was a healthy green in April. Then one morning I looked out and it had died as if shot by a gun. Yanking it from the ground and placing it on a concrete apron to shoot this photo, I noted there was no root development whatsoever. It had been planted in loose, terrific soil, so perhaps there was some problem back at the factory. I planted it in the spring and that act did reward me with a fair amount of summer needle drop, perhaps some form of warning that something as amiss. 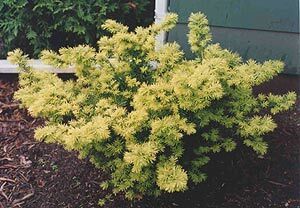 This plant, had it lived, would have matured to an irregular, dense, 5’ by 5’with bicolor foliage. Oh yes, I plant stuff only to have it die. If you need a little refresher on dealing with death in the garden, may I refer you to the column Lesson in Humility.